Harvey Ernest Jordan, 1924. Prints01873, Special Collections, University of Virginia Library, Charlottesville, Va.
A columned portico designed by Professor Fiske Kimball, head of the Department of Art and Architecture at the University of Virginia and author of Thomas Jefferson, Architect, was added to the front of the building in 1920. The portico was made under the tenure of Dr. W. A. Lambeth, Superintendent of Grounds and Buildings of the University. Lambeth was also a physician, the University’s first athletic director, and the author of Thomas Jefferson As an Architect and a Designer of Landscapes. Anatomical Theatre, post 1919. In 1920, a columned portico designed by Fiske Kimball was added to the front of the Theatre. Prints07393, Special Collections, University of Virginia Library, Charlottesville, Va.
Anatomical Theatre, ca 1930s. In addition to the front, the photo shows the right side of the building. Photographs of the University of Virginia, MSS 15048, Special Collections, University of Virginia Library, Charlottesville, Va.
At the end of the 1923-1924 session, the Anatomical Theatre was condemned as unsafe for medical students. 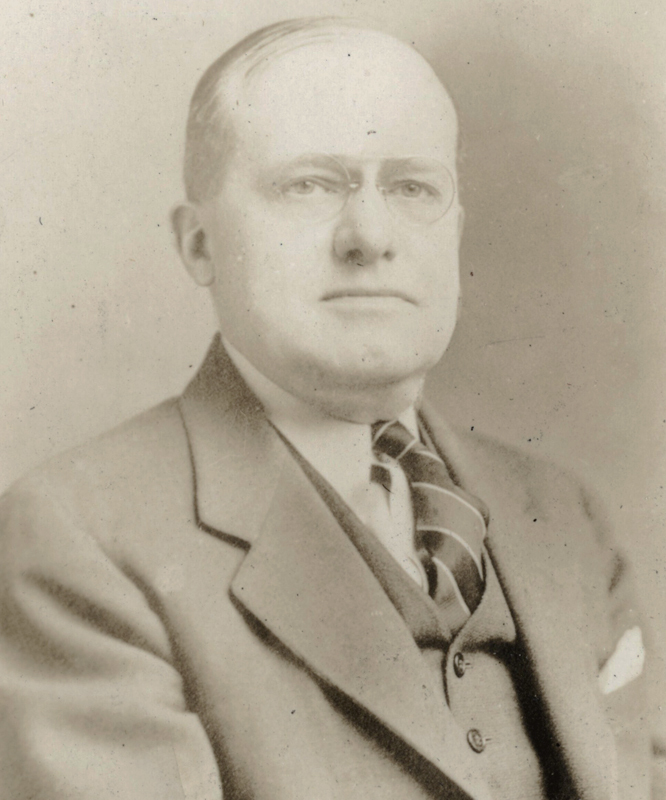 In 1924, the Board of Visitors minutes show a request granted for nearly $3,700 from Theodore Hough, Dean of the School of Medicine, which included funds to pay for the move out of the “old Medical Building” and for 54 chairs to be used by the medical department in the Washington Hall lecture room. Washington Hall, (Hotel B), was located on the other side of the Rotunda at the north end of the East Range. Professors also scattered to the basement of the old Fayerweather Gym, the attic of Cabell Hall, and buildings at the north end of the West Range. 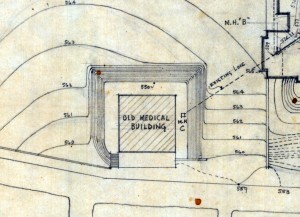 It would not be until 1929 that the “new” medical school building opened. On Founder’s Day in 1924, the president of the University of Virginia, Edwin A. Alderman, proposed the erection of a new library to replace the University’s central library housed in the Rotunda. Construction was delayed for many years until the University received a grant to cover part of the cost from the Public Works Administration which had been created under the 1933 National Industrial Recovery Act in response to the Great Depression. 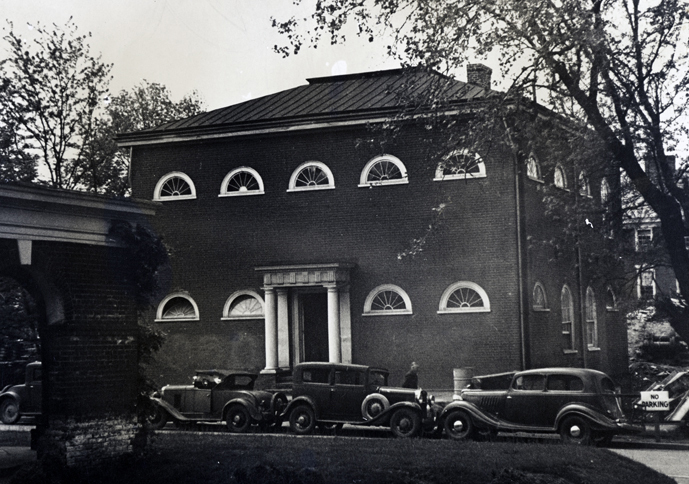 Groundbreaking occurred in 1936, and the new library, named for Alderman, was formally dedicated June 13, 1938, during Final Exercises. Plot Plan Showing Est. Grades & Sub-Soil Drainage, University of Virginia Library by Taylor & Fisher, Architects, November 20, 1936. 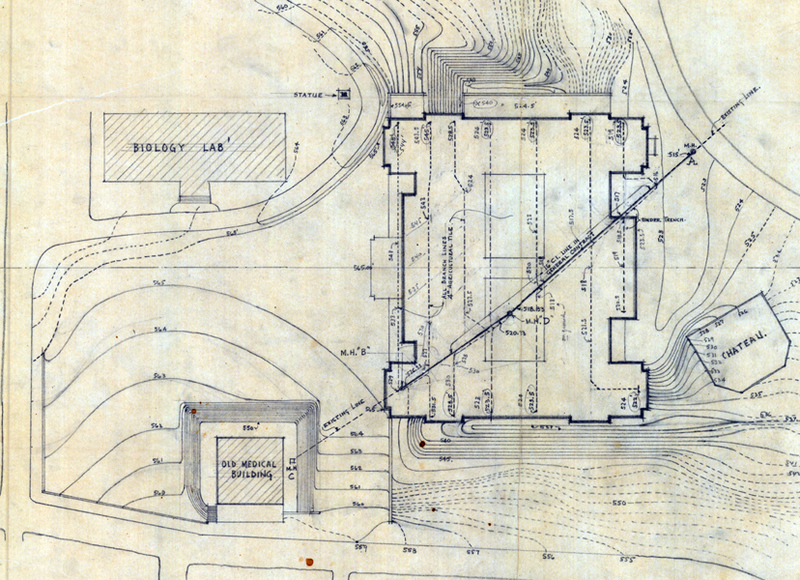 Grade contours shows the difficult setting the Theatre found itself in with the Library construction. 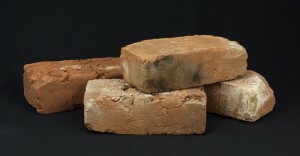 University of Virginia Facilities Management. 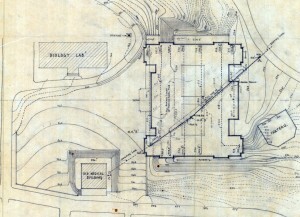 Enlarged section of Plot Plan Showing Est. 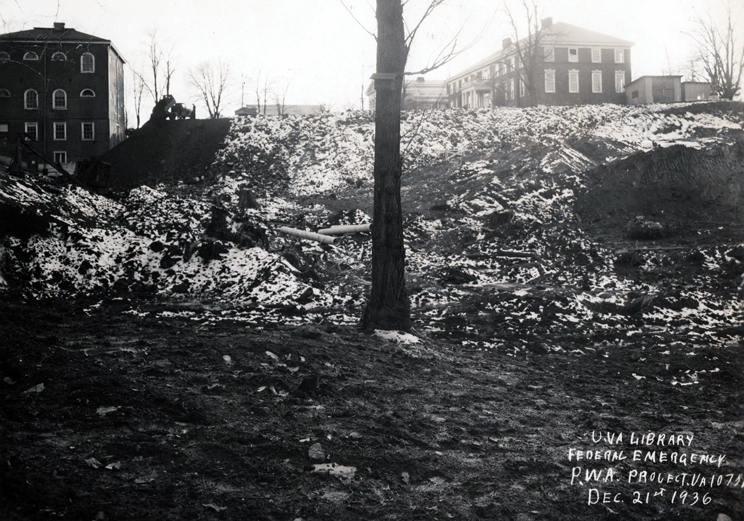 Grades & Sub-Soil Drainage, University of Virginia Library by Taylor & Fisher, Architects, November 20, 1936. The embankments, as drawn, were at an angle of almost 45 degrees. University of Virginia Facilities Management. Construction Site for Alderman Library, December 21, 1936. 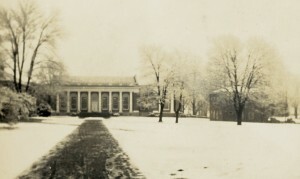 The right side of the Theatre is to the left of the photo; the back faces Miller Hall which was built in 1868 and demolished in 2002. Prints09543, Special Collections, University of Virginia Library, Charlottesville, Va.
Construction Site for Alderman Library, February 20, 1937. The chapel is to the left; the back and right sides of the Anatomical Theatre are to the right of the photo. Prints09460, Special Collections, University of Virginia Library, Charlottesville, Va.
Alderman Library and the Anatomical Theatre, ca. 1938-1939. Alderman Library was formally opened in October 1938, and the Anatomical Theatre was demolished the following summer so this photo was taken in the winter of 1938-1939. 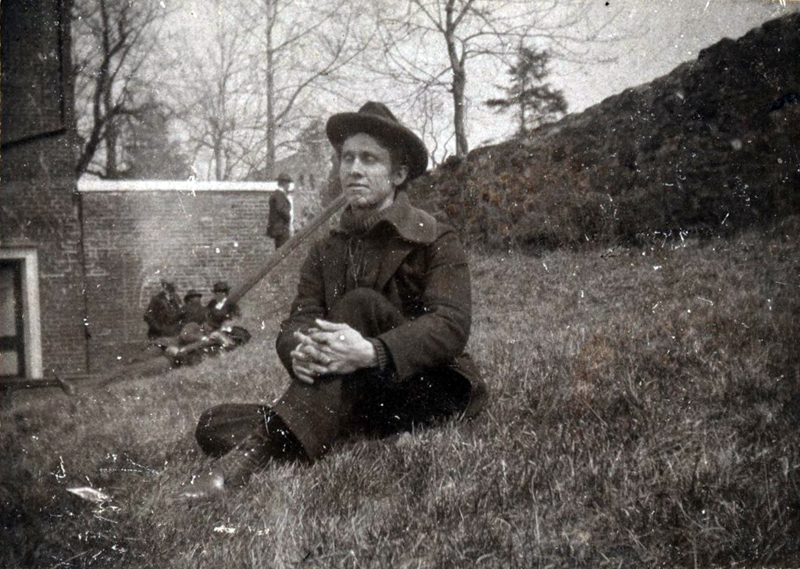 Photographs of Francis L. Berkeley, Jr. Charlottesville and the University of Virginia, ca. 1929-1940, Accession #13417, Special Collections, University of Virginia Library, Charlottesville, Va.
Six weeks before the Library’s dedication, John Lloyd Newcomb, the University president who replaced Alderman, had posed the question of the removal of the old Medical Building which by this time was basically a poorly maintained storeroom and a fire hazard. Newcomb asked for the opinion of the Board of Visitors on the issue. 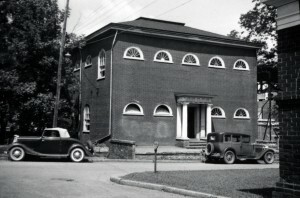 Any ensuing discussion was not recorded, but it has been suggested that the presence of the Theatre ruined the vista of the new library, and the following motion was adopted: “Resolved, that it is the sense of this Board that the old Medical Building on West Range be removed at the convenience of the President.”  The image to the right shows that both Alderman Library and the Anatomical Theatre coexisted for a time. Anatomical Theatre Demolition by Atcheson Laughlin Hench, July 1939. 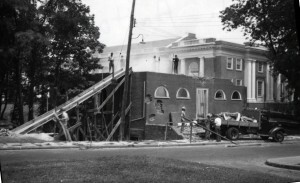 Prints07404, Special Collections, University of Virginia Library, Charlottesville, Va.
Anatomical Theatre Demolition by Atcheson Laughlin Hench, June 16, 1939. Prints07406. Special Collections, University of Virginia Library, Charlottesville, Va.
Nearly 60 years after the Theatre’s demolition, the Office of the Curator and Architect for the Academical Village hired the firm of John Milner Associates to determine the location of “the [Theatre] building footprint and document the remaining evidence of construction materials and methods.”  This was to be done so that “building remnants could be taken into consideration when planning for projects that might disturb them.”  Only part of the area was excavated because of mature trees near the site, deep excavations up to 20 feet that were prone to collapse, and the location of the former front of the Theatre under the McCormick Road and sidewalk. Anatomical Theatre by Atcheson Laughlin Hench, 1937. This shows how narrow the road in front of the Theatre used to be compared to the present-day McCormick Road. 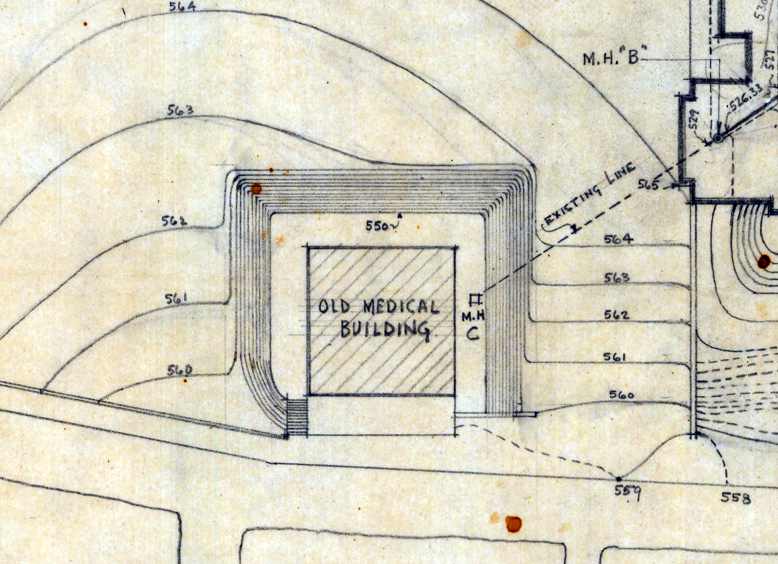 Given the width of the road today, the John Milner Associates concluded that the east wall, or the front of the Anatomical Theatre, is under the middle of the sidewalk bordering McCormick. Prints07408, Special Collections, University of Virginia Library, Charlottesville, Va.
Excavation of Theatre, July 1997. Prints11727, Special Collections, University of Virginia Library, Charlottesville, Va.
Anatomical Theatre Stone Marker, 2016. 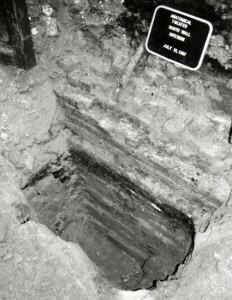 After the excavation, markers were placed at the site of the Theatre. 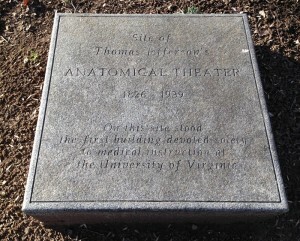 One reads: Site of Thomas Jefferson’s ANATOMICAL THEATER 1826-1939. 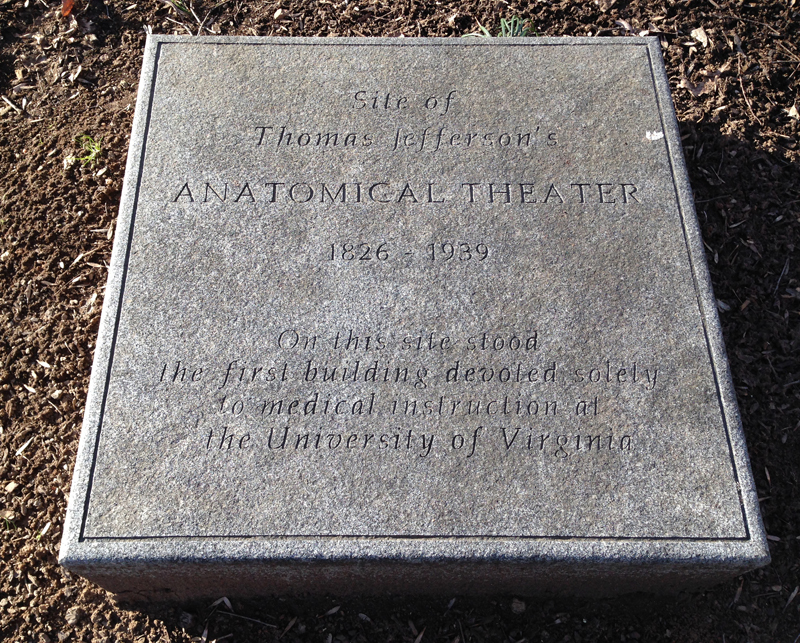 On this site stood the first building devoted solely to medical instruction at the University of Virginia. In 2000, within several years of the 1997 report, groundbreaking ceremonies were held for the Mary and David Harrison Institute for American History, Literature, and Culture and the Albert and Shirley Small Special Collections Library whose square footage is 80 percent underground stretching in front of Alderman Library and towards the site of the demolished Anatomical Theatre. James Bell Bullitt, ca. 1896. 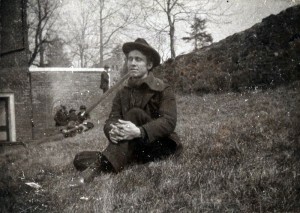 James Bullitt was a graduate of the medical school in 1897. 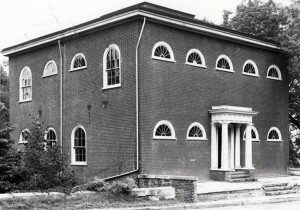 Behind Bullitt, notice the terrace basement which joins the Anatomical Theatre and the historic West Street, now McCormick Road. To the right is the stone wall discovered in the 2008 archeological study. Prints09231, Special Collections, University of Virginia Library, Charlottesville, Va.
U.M. 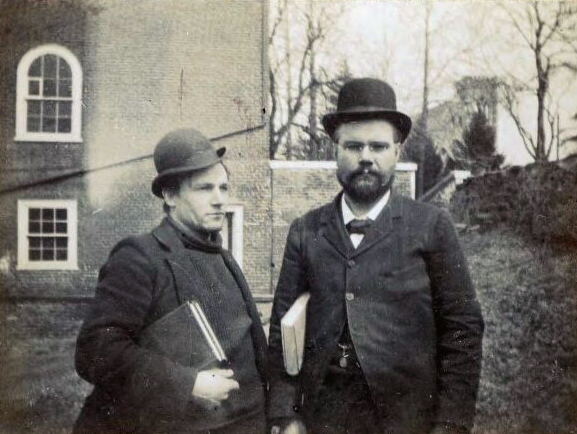 Carwell and H. Baptista, 1896. Ulysses Carwell was an 1898 medical school graduate, and Hans Baptista was attending his second session in 1896-1897. To the right is the stone wall discovered in the 2008 archeological study. It abutted the historic West Street, now McCormick Road. Prints10525, Special Collections, University of Virginia Library, Charlottesville, Va. 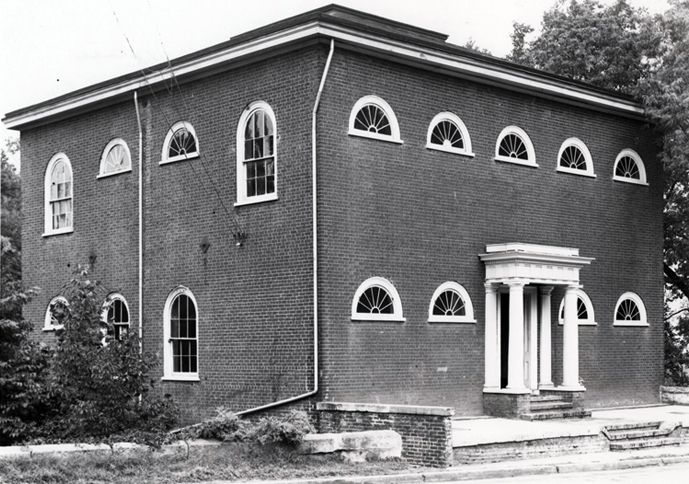 Roughly two centuries have passed since workmen followed Thomas Jefferson’s plan for the Anatomical Theatre to provide Dr. Robley Dunglison with a dedicated building to teach students about anatomy and medicine. 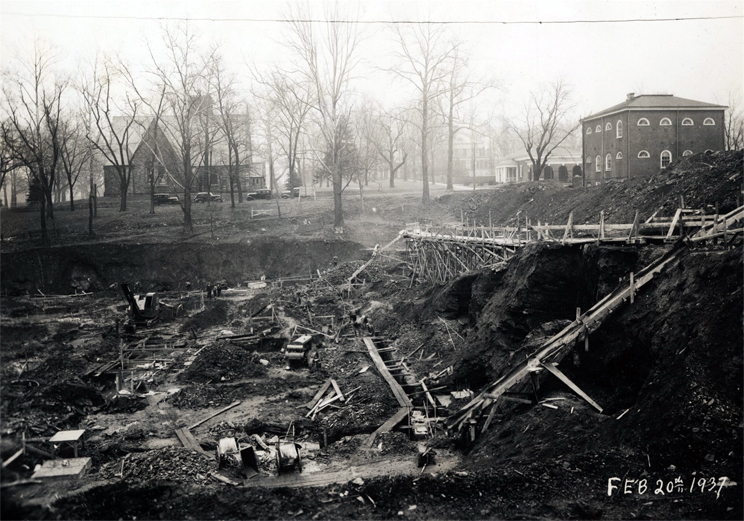 The building is gone now with some few remains buried in place, and its bricks scattered to repair other historic buildings or the serpentine walls around the University of Virginia gardens. However, it still sheds light and casts shadows on parts of the University story: the difficulty of anatomical study, particularly before the passage of the 1884 Virginia Anatomical Act; the treatment of enslaved people, even after death; the effect of the Civil War; the fight for financial support for education; human cooperation and obstruction; a missed opportunity for historical preservation; and faculty dedication, far beyond the expected. More than seventeen hundred medical school graduates were taught and studied in the Anatomical Theatre. They scattered and are gone now too, but their legacy of learning and their desire and ability to heal patients affected thousands of lives in the 19th and 20th centuries which in turn affected many in the 21st century. 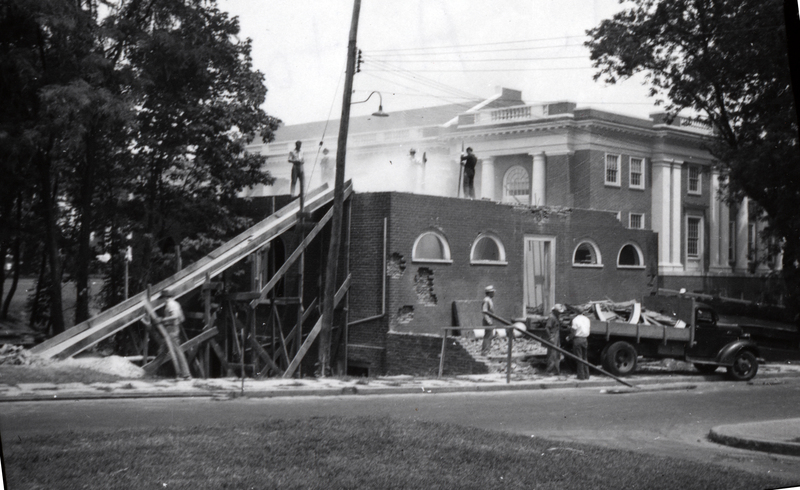 Remarkable changes have occurred since the Theatre was the center of medical education at the University of Virginia. Today there is a state-of-the-art education building, with a medical simulation center; a large faculty devoted to teaching, patient care, and research; a library that provides an outstanding array of resources, and classes that are much more diverse. What hopefully remains constant over these two centuries is the desire of teachers to teach and students to learn, with the goal of improving health care. 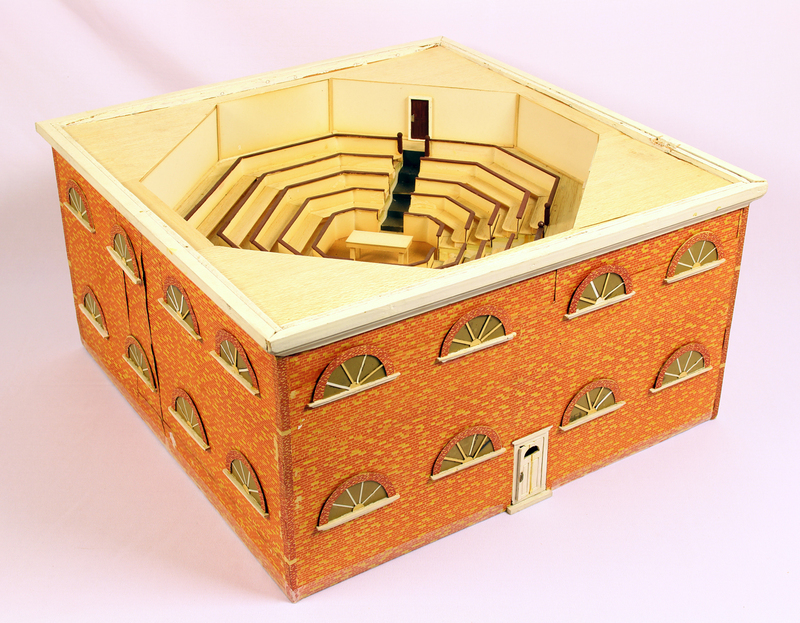 Anatomical Theatre Model. The model shows the theatre as designed by Jefferson. Photo by Emily Bowden, Historical Collections, Claude Moore Health Sciences Library, Charlottesville, Va.
Anatomical Theatre Model. The detachable roof is removed to show the top-most floor. 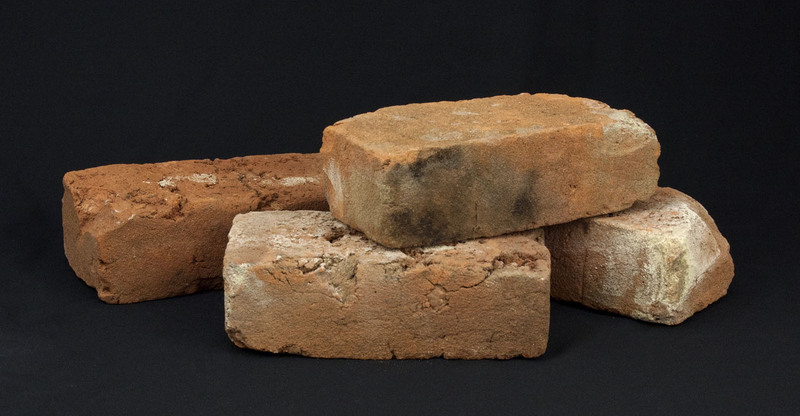 Photo by Emily Bowden, Historical Collections, Claude Moore Health Sciences Library, Charlottesville, Va.
Anatomical Theatre Bricks. Photo by Emily Bowden, Historical Collections, Claude Moore Health Sciences Library, Charlottesville, Va.
A model of Thomas Jefferson’s Anatomical Theatre was made by Ira L. Full and presented in 1969 to Dr. Chalmers L. Gemmill, a professor of pharmacology who joined the University of Virginia faculty in 1945 and retired in 1972. In addition to being department chair for most of those years, he was very interested in the history of medicine. 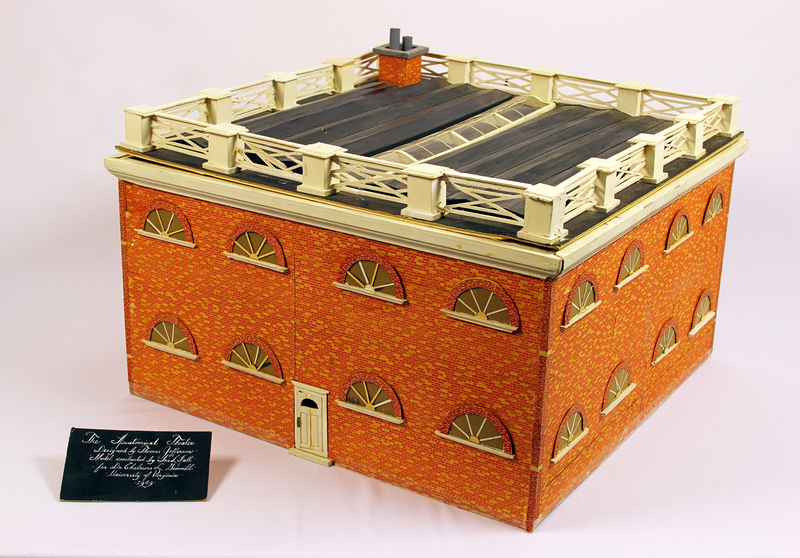 This model now resides in Historical Collections in the Claude Moore Health Sciences Library as do four salvaged bricks. University of Virginia, Board of Visitors. Minutes, April 29, 1938, 293 Retrieved from http://guides.lib.virginia.edu/bovminutes. 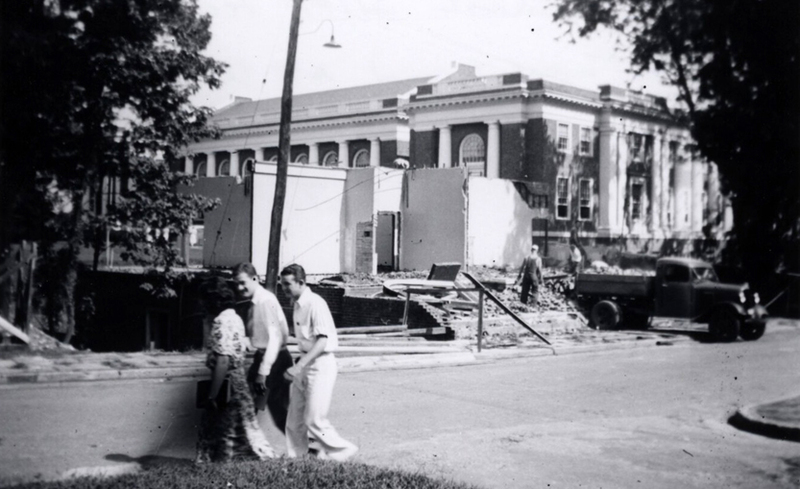 Jordan, Harvey E. History of the School of Medicine of the University of Virginia.Charlottesville, Va., 1952, 15. Dabney, Virginius. Mr. Jefferson’s University: A History. Charlottesville: University Press of Virginia, 1981, 190. Edwin M. Betts Memorial Collection of University of Virginia Prints, Photographs and Illustrations, 1817-1930, Folder 31. MSS 7073, 7073-a, Special Collections, University of Virginia Library, Charlottesville, Va.
University of Virginia, Board of Visitors. Minutes, November 26, 1924, 21. University of Virginia, Board of Visitors. Minutes, June 15, 1925, 89. “U.Va. Celebrating 75th Anniversary of Alderman Library’s Opening,” UVA Today, October 11, 2013, Retrieved from http://news.virginia.edu/content/uva-celebrating-75th-anniversary-alderman-library-s-opening. Cheek, Charles D. and Dana B. Heck. Archeological Investigations at the Site of the Anatomical Theatre (44AB443) University of Virginia, Charlottesville, Virginia. West Chester, Pa.: John Milner Associates, Inc., Alexandria, VA., 1997, 3. Historical Collections & Services, Claude Moore Health Sciences Library, University of Virginia. University of Virginia, Board of Visitors, Minutes, April 29, 1938, 293; Gilliam, Alexander G. “Letters to the Editor: Historical Issues.” Virginia, Fall 2010, Retrieved from http://uvamagazine.org/articles/letters_to_the_editor16; Sharp, Henry K. and Morton C. Wilhelm. 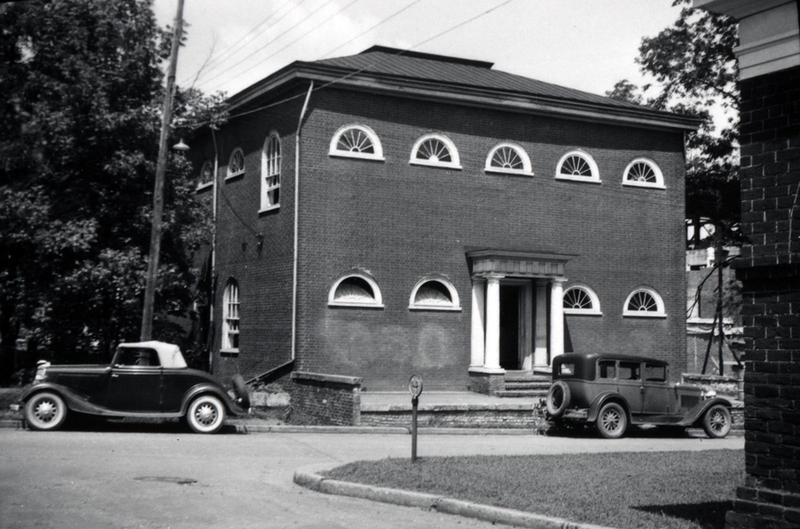 A History of Cancer Care at the University of Virginia, 1901-2011. Lancaster, Pa.: DEStech Publications, 2011, 46 . Jordan, 17; University of Virginia, Board of Visitors, Minutes, April 29, 1938, 293. “Dr. Harvey E. Jordan Dies …”, Medical Alumni News Letter 16:2 (December 1963-January 1964): 6. Ford, Benjamin, Principal Investigator and Nick Bon-Harper, Project Archaeologist and Report Author, Rivanna Archaeological Services. Poe Alley, McCormick Road Investigations, Volume II, McCormick Road Storm and Sanitary Improvement Project, March 2009. Charlottesville, Va.: University of Virginia, 2009, i, 45. Special Collections, University of Virginia Library, Charlottesville, Va.
© 2019 Anatomical Theatre at the University.